If you are working, who is your current employer and what is your role? I currently work for ScienceVision Sdn Bhd (it is a biotechnology company). My role is to educate the public on genetic screening and precision medicine. I am also involved in creating and promoting brand awareness of genetic screening using digital marketing. How has your student experiences made a difference to the way you approach your work and career? As a postgraduate student, I needed to present my research progress to my supervisor daily and to my panels on a yearly basis. This experience trained me to become a confident and vocal person. It is very useful for me to communicate with clients who are from various backgrounds (scientific and non-scientific) and to present my proposals to them clearly. 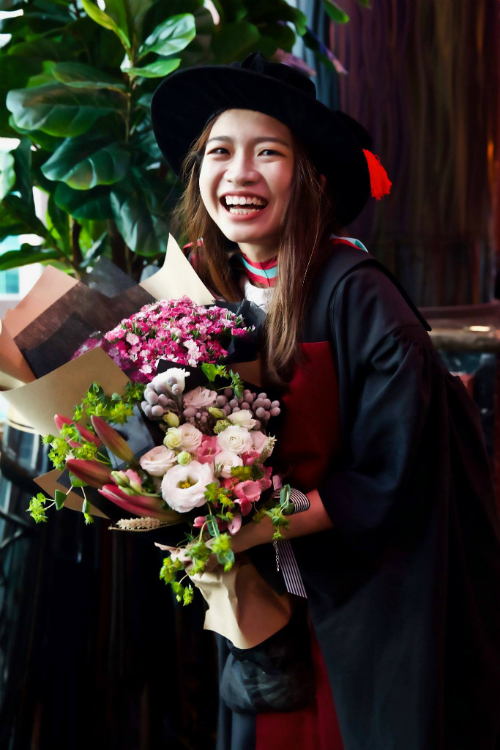 Why did you choose Monash Malaysia? I chose Monash Malaysia because it offers an internationally recognised Australian Education and has ongoing research activities. While at Monash, what type of opportunities did you participate in? During my PhD journey, I was grateful to have had the opportunity to represent Monash University and attend the International Plant Protection Congress (international scientific conference) in Germany. I was able to network and exchange research ideas with experts who have worked in the similar field as mine and incorporate their feedback to improve my research structure. In addition, thanks to Cross-Campus Initiative Funds (CCIF), I had the chance to visit Biospectroscopy Lab, School of Green Chemistry, Monash University Clayton for two months, with the aim of sharing each lab’s expertise and research experience. That was my first time to Melbourne, Australia and it was definitely one of my unforgettable moments. What insights, skills or experience made a difference to your own life or the lives of others around you? Other than technical skills and research experience, I developed other skills that came in handy when I started my new job - critical analysis, time management, idea presentation and writing skills. I found the resources offered useful and complete for research students like me to write our publications and thesis. I also loved the times when I participated in events organised by Monash University Postgraduate Association (MUPA), including outdoor activities, networking tea session and annual dinner. Outside work or study were you able to build on your interest i.e. volunteering, mentoring other students, other educational pursuit)? Yes, I was able to build on my interest in teaching, which is mentoring and tutoring undergraduate students. I realised that I enjoyed teaching and guiding students to the of my knowledge through this experience. What is your goal/dream in life, where are you headed to in the future? My dream is to make more people love and appreciate science. Who knows, you might see me doing science education in the future. What is your advice to current Monash Malaysia students? Enjoy your student life. It is the best time for you to learn who you want to be in the future. Make more friends, seek advices from lecturers, do more volunteering jobs, join club activities etc - you will never know how precious the experiences will be in the future.